After checking to see if the coast was clear animal-wise, we climbed down the ladder and set up the breakfast table. 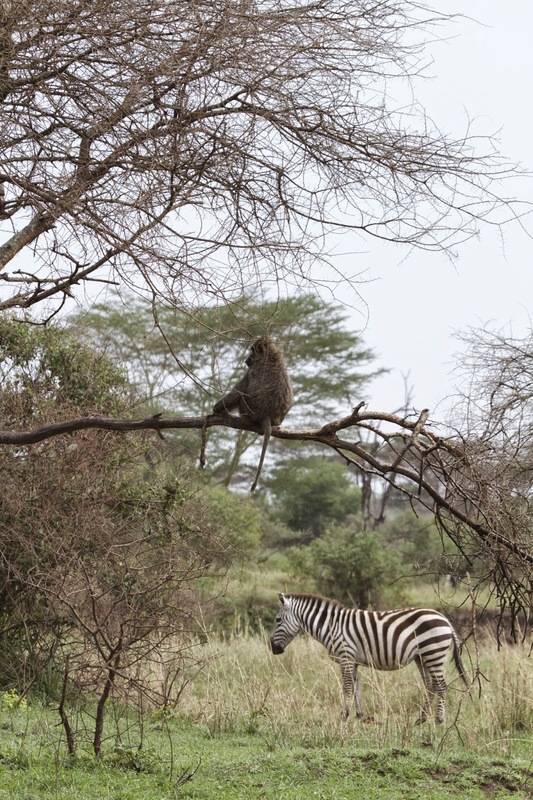 It was our first morning in the Serengeti and it was nice not to be in such a rush for once. 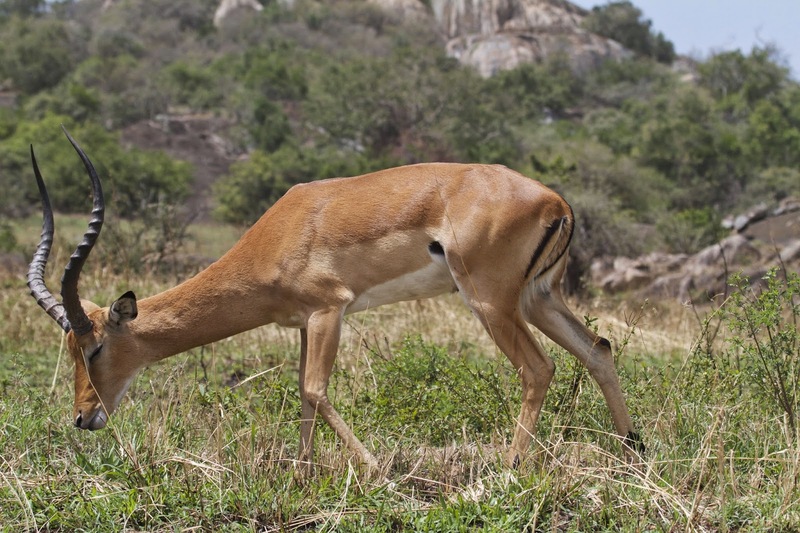 We sat and drank our coffee watching the gazelle graze in the field behind camp, such a stereotypical African experience we had to giggle to ourselves. Thompson gazelle watch as we eat our cereal. Our first stop was right across the road; the Grumeti River was over there and we were on a mission to see some crocodiles. We sat and stared at the muddy river for a long time, daring each other to get out and take a closer look. Neither of us would leave the car so, sans bait, the crocs stayed hidden. Damn. The Grumeti River. Somewhere in there a crocodile waits for one of us to get out of our car. 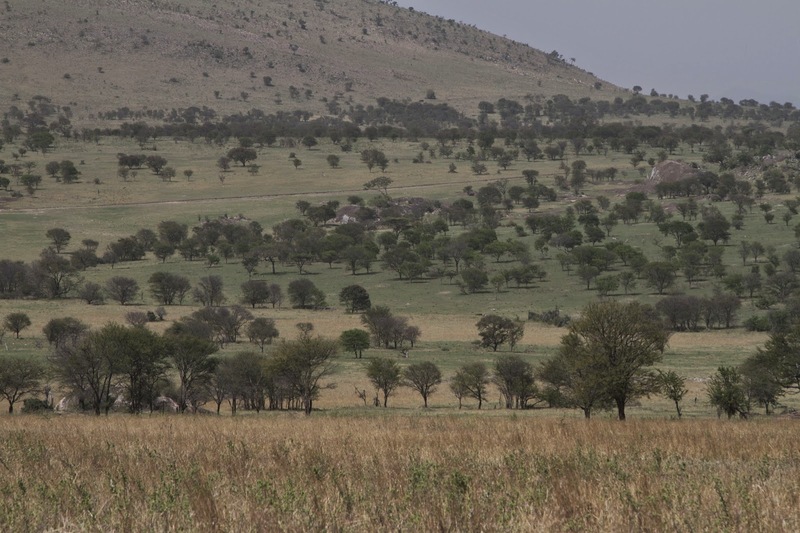 We traveled up the road, taking every game drive side loop we saw. 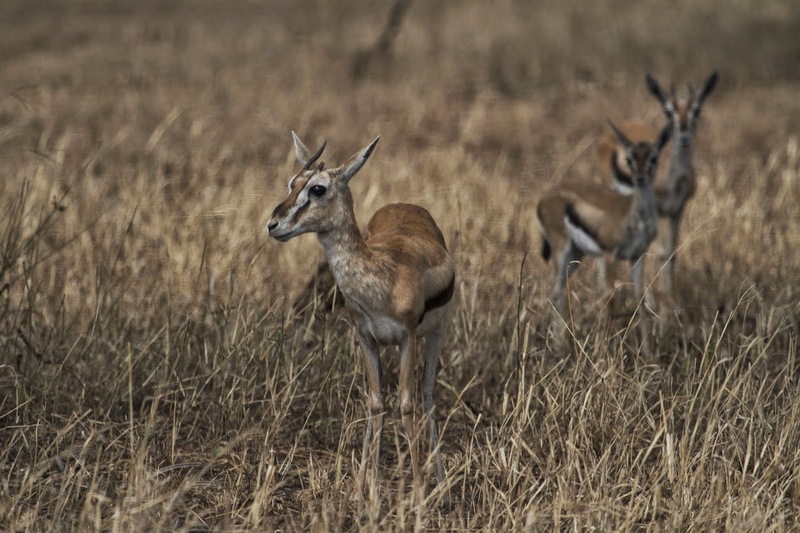 There were animals everywhere we turned, mostly small herds of gazelle and baboon with a giraffe or two thrown in and some unfamiliar animals we had to look up in our wildlife book. It was fun to putt around with no exact itinerary in mind. 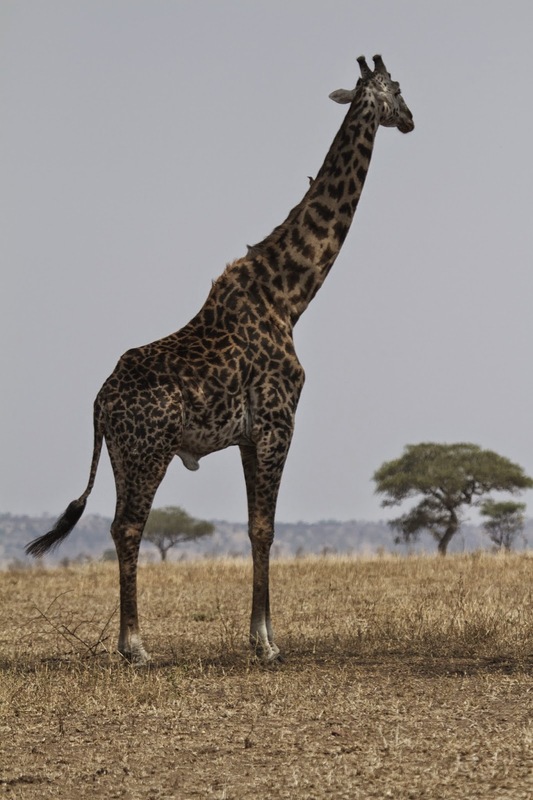 We took a road out onto a broad plain and came across a lone giraffe standing beneath a huge acacia tree. He eyeballed us as we slowly drove closer, obviously leery yet he never budged. It's amazing to realize just how huge these animals are; we couldn't get over the fact that the car was level with his knees. 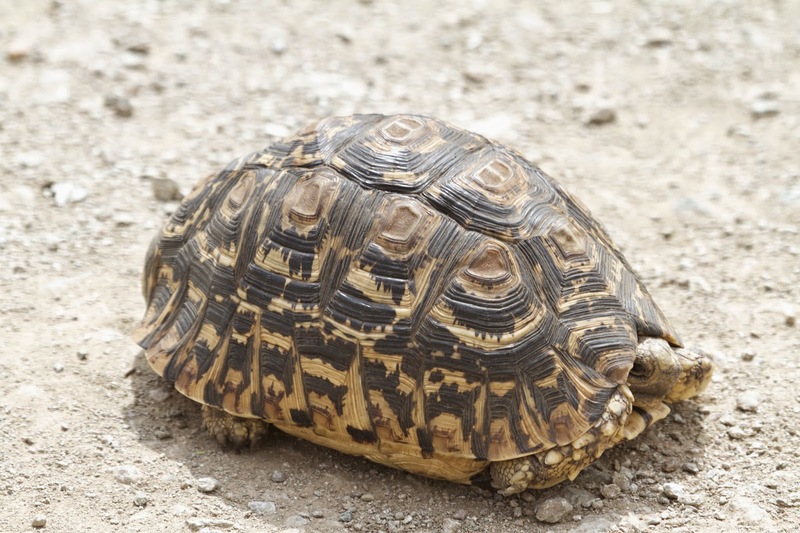 We left him in his patch of shade and continued on our game drive. 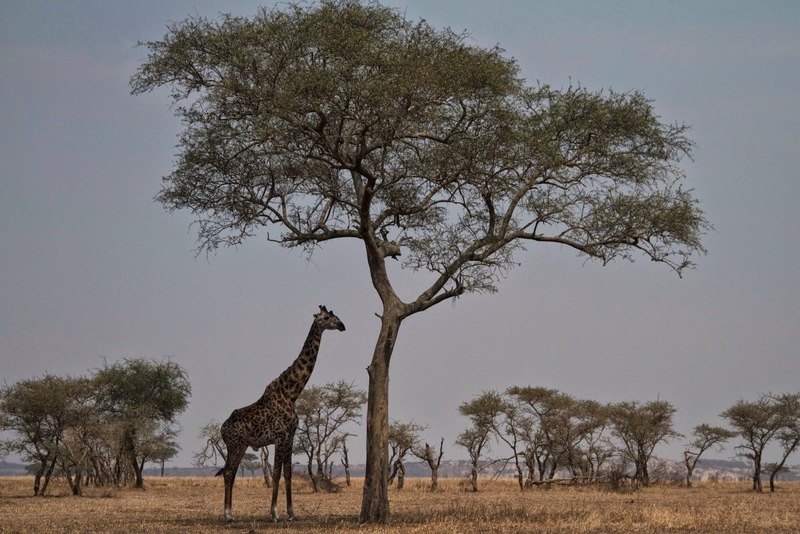 A lone giraffe stands stock-still under a huge acacia tree. A closer look, complete with his bird friends. We found a promising looking road that skirted a rocky hill; it looked as if not long ago it had been very muddy, judging from the deep ruts in the dried dirt. It meandered along a scrubby route, winding in and out of the trees. We came across the remnants of an old camp and stopped to check it out. Immediately we were sorry we had done that. Not just a "shoot, it bit me" kind of bite, either. More of a "M#$^&r F&#$%*r! GET IT OFF ME!" kind of bite. We were both wearing shorts and t-shirts with long sleeve shirts that were treated with insecticide. We figured during our trip we might have to dab some bug juice on our legs and faces, but we hadn't had any insect trouble up to this point. It was far too late for that now. The flies were pouring in through our open windows, so we rolled them up. This only served to trap them in so they could dine without the pesky wind to ruffle their wings. These were a hardy bunch; unlike a mosquito, they never seemed to get their fill. Clothing didn't slow them down either; they were able to drill right through two layers of shirt and the heavy canvas material of our shorts. I swear one bit me through the mesh of my shoe and sock. And painful! Each bite was like a tiny bee sting, a hot needle drilling into your skin. To get them off you had to scrape at them; they wouldn't fly away until you touched them. We ended up using an Alaskan trick helpful when the truck cab would fill with mosquitoes: roll down the windows and drive like hell until the little bastards blow out. This worked for all but the most tenacious ones. Never in my life have I felt as satisfied as when I killed the last two flies in the car with the swatter Shaw had thoughtfully stuck in the dash. After that excitement, we decided to make our way back to camp and enjoy a little quiet time. 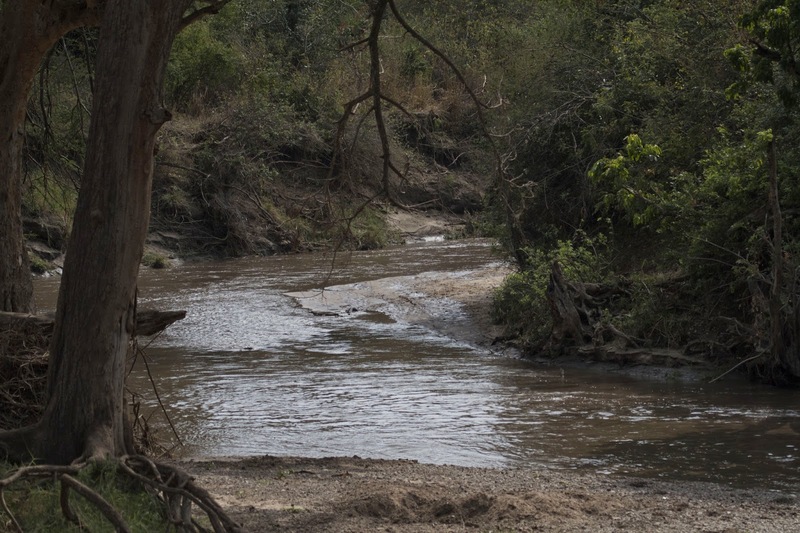 We looked for our cheetah friends in the creek bed on the way into camp, but they must have found a better hangout because there was no sign of them. We parked in our spot and set up the tent, putting our chairs in it's shade and enjoying a cold coke from the cooler. Nothing, and I mean NOTHING, tastes as good as an icy cold coke after driving an un-air conditioned Land Rover on hot dusty roads (with the windows rolled up) all afternoon. We relaxed, did some reading and caught up on our housekeeping. We did a load of socks and underwear in our washbasin and hung them up on a clothesline in the back of the car. Did we look like hillbillies? You betcha. But we would have some clean undies to wear tomorrow! 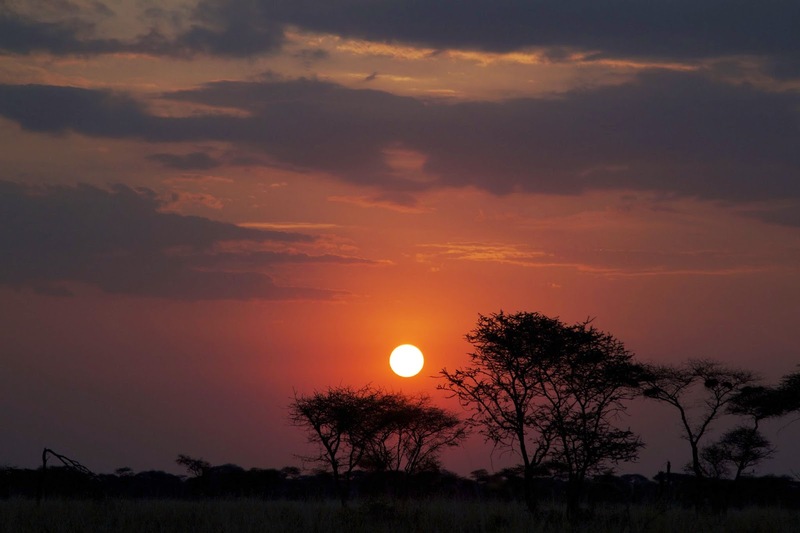 Another African sunset. Just beautiful. That night just after we went to bed we heard some scuffling outside. It was pitch black, so Mark pulled out the high powered flashlight he had purchased just for this trip. Right below us, two huge porcupine were scruffing through the dirt, nosing around for crumbs we had dropped during dinner. I've never seen a porcupine so close, and had no idea they got so big. Judging from the long spines on them (at least a foot and a half long), they didn't have to worry about predators. Mark was having fun playing with his flashlight and decided to check out the rest of the camp. It was such a warm night we had all the windows open so it made it easy to shine the light, sweeping the camp in a large circle. A hundred sets of eyes glowed back from every direction, some surprisingly close in. He turned it off quickly and pulled the covers up to his neck. Some things are better left in the dark. The next day we were scheduled to move to another campground, but first we had to get more fuel and try again to find some food and water. We drove back to Seronara, stopping in to get diesel before heading back to the visitor's center. The help desk was unmanned when we got there, so we went over to the little gift store to do some shopping. We poked around while the owner sat at his desk, counting up huge stacks of cash. It amazed us how nonchalant storekeepers were with their money here; at home, the cash drawers are quickly whisked away to be counted behind a locked door. Here the guy was sorting out both U.S. dollars and Tanzanian shillings, stacking the bills into piles by denomination. The fan was blowing them around his desk, forcing him to put wooden figurines on them to keep them in place. Friends of his would wander in and say hello, distracting him just enough so he kept having to re-count the stacks. There must have been at least 2000 U.S. dollars there. It's hard to estimate how many shillings he had; I never did get used to the immense numbers on the notes so I'm sure it wasn't nearly as much as it appeared. 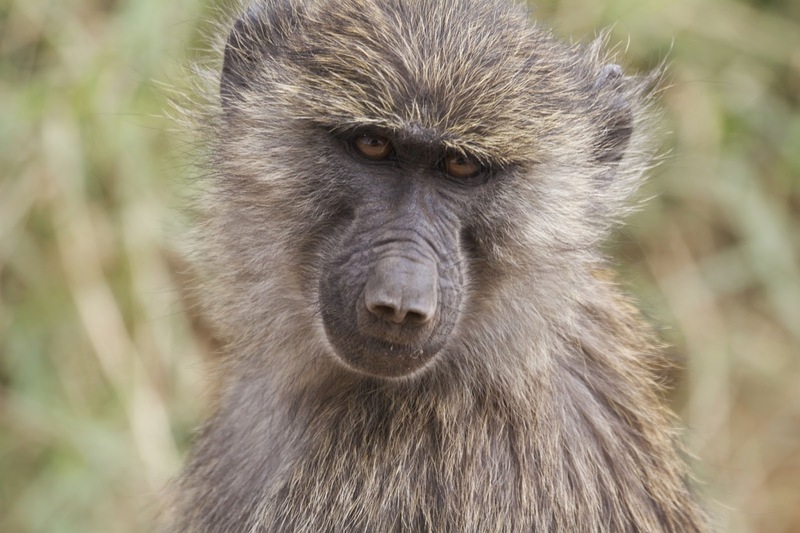 A young baboon looks into the camera lens. We liked some of the gift items, but it seemed the prices were hiked up for the fancy safari crowd so we passed. Something we didn't notice the first day, however, was that below all the cokes in the cooler, there was a line of 1 liter bottles of water. Thank goodness! We were down to our last liter and had another day and half until the next town. We bought five more bottles, figuring that would get us through to the next stop. We asked about food, but with some translation difficulty were told we might get prepared food at the lodges (probably a boxed lunch or a sit down dinner.) There didn't seem to be any grocery-type stores in the park. After looking longingly at the chocolate bars, Mark dragged me out of the store with just the water. Ok, so the food box was getting a bit lighter but there were still quite a few things in there, we'd just have to get more creative. Back up the same road, we crossed over the river just outside Seronara and out of the corner of my eye I spotted it: a crocodile! Big signs on the road warned drivers it was illegal to stop on the bridge, so Mark had to keep driving. By the time we got turned around and I got the camera out, the croc had submerged. Darn it! At least we got to see one. 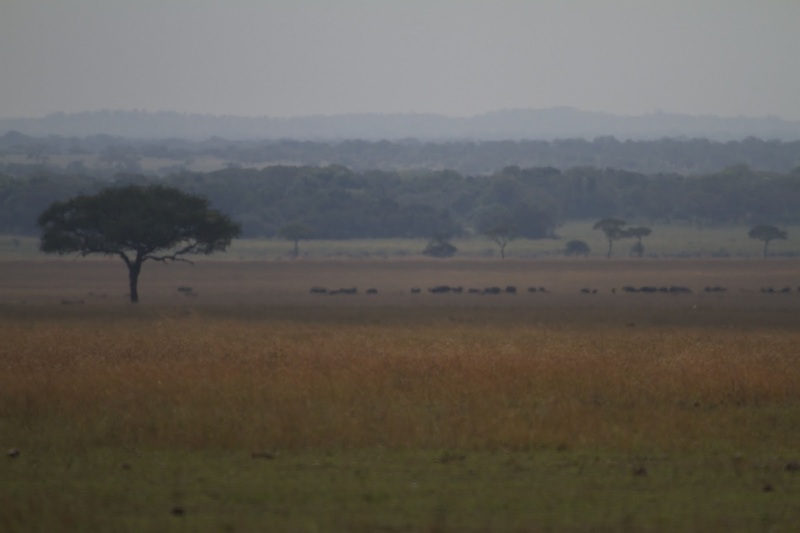 A herd of wildebeest on the hazy plains. This is one of my favorite photos, the heat waves and smoke from a recent fire making it look like a watercolor. 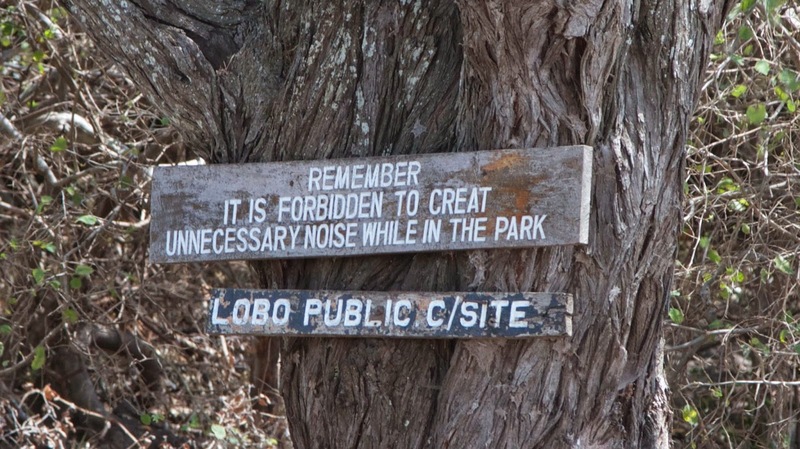 We were driving up to Klein's Gate and the Lobo Hills campground, the northern-most area of the park. As we traveled, the countryside subtly changed from dry grassy plains to green rolling, rocky hills. The road got rougher as well; corrugation turned to bumpy embedded boulders, forcing us to slow down even further. Good thing we didn't have as far to travel today. We passed a large flatbed tow truck as it slowly picked it's way through the rocks on the narrow road. Man, wouldn't want to be that guy. Wonder where he's going? We got our answer soon enough. 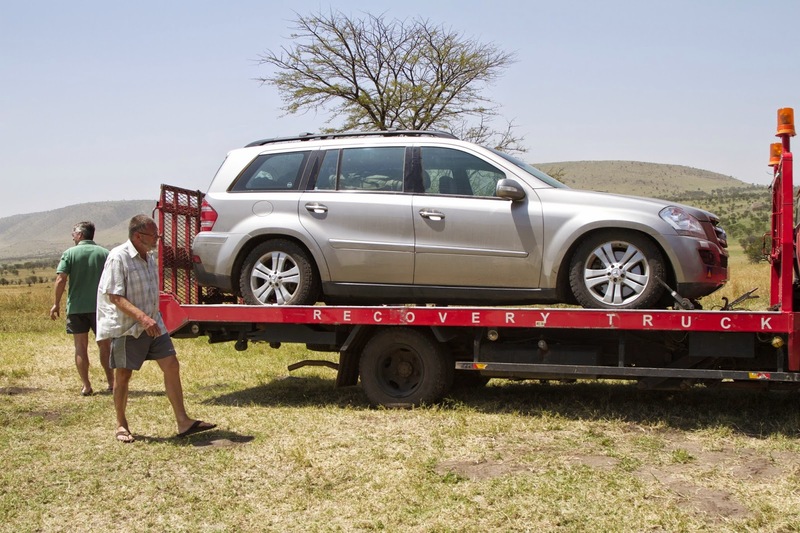 We pulled into the Lobo Hills campground to find a brand new Mercedes SUV, the body settled down on it's wheels. The owner, a big blustery guy from South Africa, had driven it all the way up to the Serengeti where he had blown out the air suspension on the road. "In all my life, I have never driven such bad roads! I will never come here again! They need to fix these roads! It's ridiculous!" Mercedes SUV on the back of the tow truck, unhappy owner in the foreground. We nodded in agreement, but had to turn away before he saw us smile. What was he thinking? Not only was he driving this cushy, city vehicle but he was pulling a huge camping trailer equipped with tent, full kitchen, and all sorts of gear. The poor car had been put through hell. Frankly, we were surprised he got as far as he did. 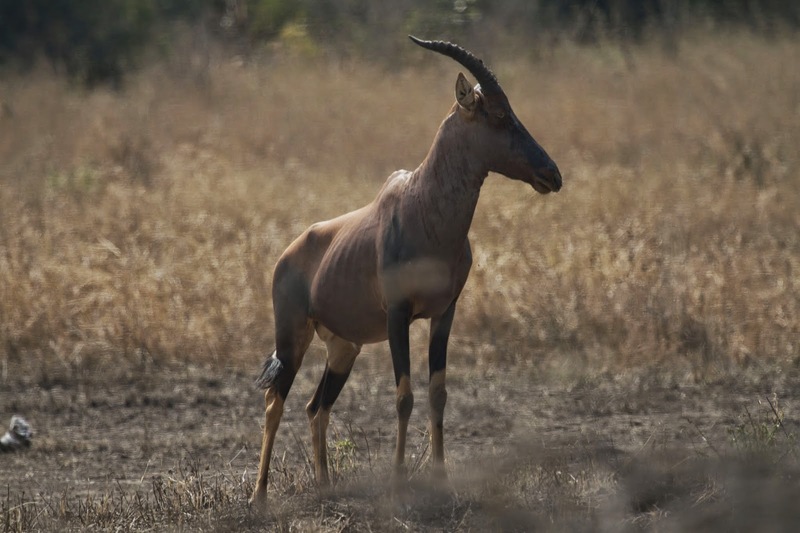 Normally, the great migration would already be well into Kenya at this time of year, but Tanzania had some unusually late rains and the wildebeest had turned around and come back. No wonder it was greener up here. Climate change had done us a favor for once! Since we had to drive that way the next morning anyway, we decided to hang around camp for the afternoon. 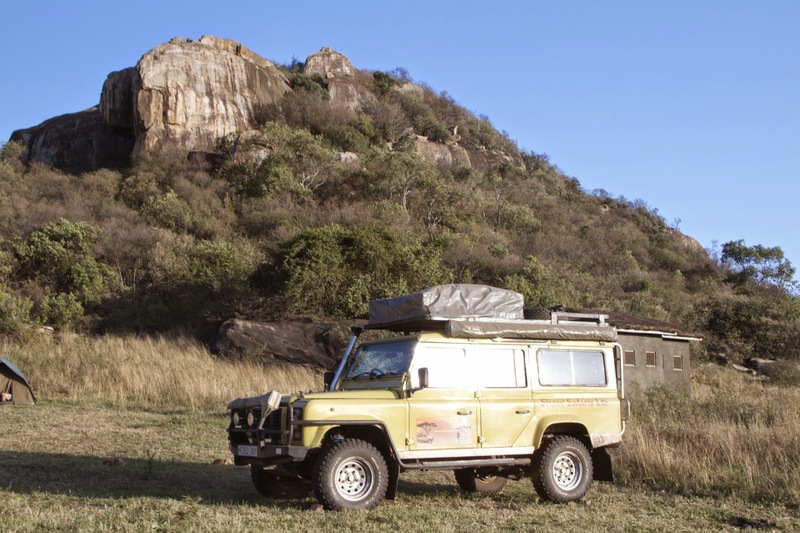 The wind was screaming down off the kopjes (pronounced "Cop-yees" it means granite outcroppings) that backed up the camp, and baboons sat staring forlornly at us from the rocks. 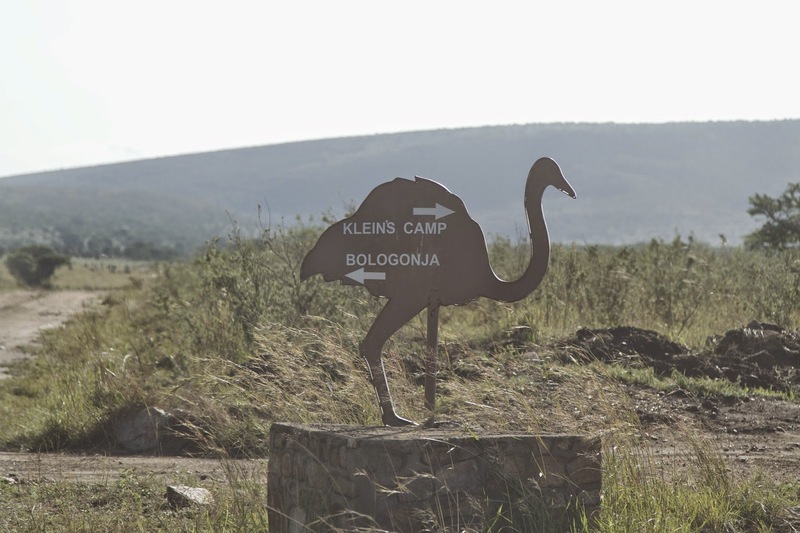 We were told by another camper that the baboons were horrible pests the night before; they tried to steal the campers' food and everyone was forced to use the enclosed picnic area. Even in the safety of the hut, the baby baboons climbed up the sides and reached in through the mesh windows, screeching at the people inside. The view from Lobo Hills campground, still green from the late rains. 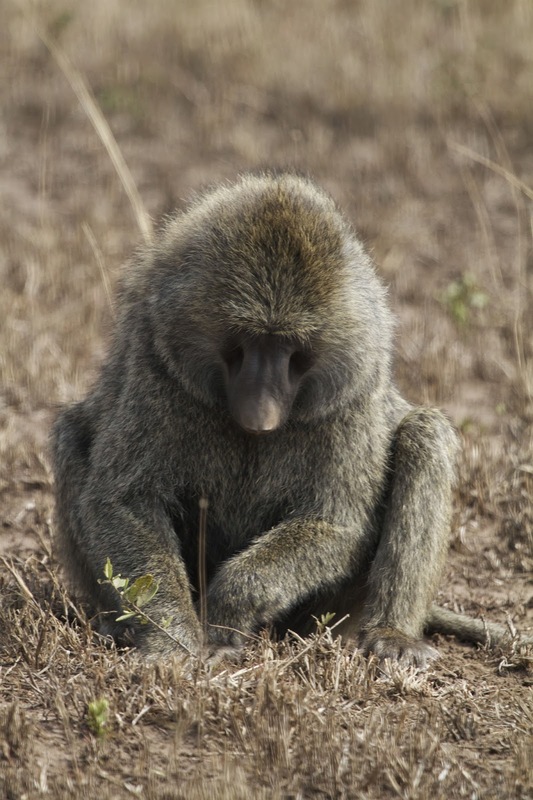 We set up camp and kept an eye on the baboons, not wanting to lose what little food we had. Around 3 o'clock they mysteriously disappeared and we never saw them again. I guess our meager options didn't impress them. After a bit two Land Rovers pulled in and arranged themselves next to us, four people piling out from each. We watched them set up, two rooftop tents per vehicle. Out came an elaborate table (with white tablecloth) and chairs, followed by a cooler that disgorged an impressive spread of cheese and meats, along with bread and of course, wine. It was hard to believe their vehicles, which were the same make and model as ours, could hold all this stuff. We sat in our little camp chairs nibbling on our broken crackers and the last of our nuts, contemplating our dinner; we had two more hot dogs left and some canned peas. We Americans sure know how to live. Our camp at Lobo Hills. As we cooked up our hot dogs (boiling them in the pot with the peas to save water) the woman from next door walked over and asked if we had any luck getting our dinner heated. The wind was still at gale force and she was having trouble getting her stove to stay lit. We showed her how to set up the stove using the back door as a shield and she thanked us, laughing that it had taken her an hour to make coffee that morning. After dinner, the patriarch of the family came over and introduced himself, bringing a "glass" (a dixie cup) of wine for each of us. He and his family were from Switzerland and were doing the same safari tour we were, just in the opposite direction. They had just come from Lake Natron, our next stop, and were headed to the Ngorongoro Crater after camping here for a few days. He warned us about the Maasai kids along the road: they had traveled through a village the day before when some boys came out begging for money. When he refused to give them anything one of the boys threw a rock, smashing his back window. He complained at the next checkpoint ("oh by the way," he told us, "there are three checkpoints and they'll charge anywhere from $10 to $20 per person to go through") and the guards said they would take care of it. Tanzania depends on tourism—it's their main source of income—and all they need is to have a bad reputation like that. I'm sure those boys were very sorry for their behavior not long after the complaint was lodged. We enjoyed visiting with them that evening. They spoke excellent English, especially their daughter who had spent some time in college in the U.S. 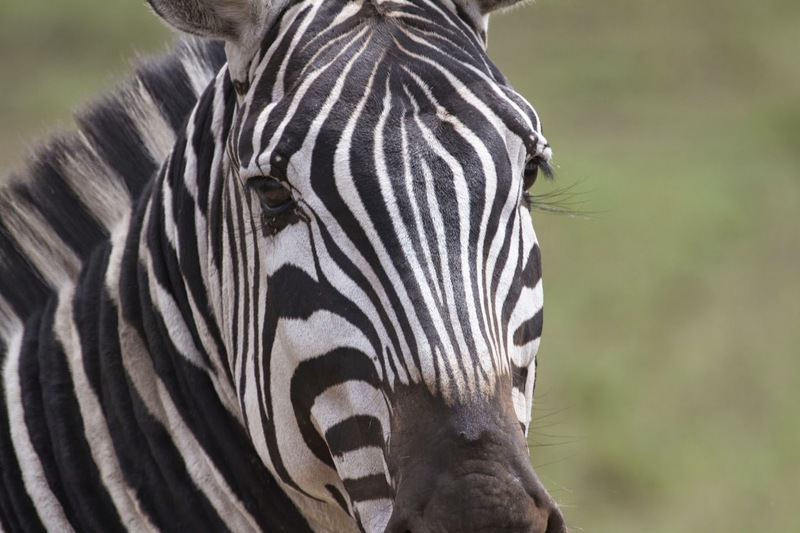 They told us they loved Africa so much they had been doing these self-drive safaris every two years, and they had enjoyed Tanzania the most of any of the countries they had visited so far. It was great to swap stories with one of the few other groups that, like us, were traveling without benefit of a guide. If anything, the wind picked up that night making it hard to sleep as the rain fly slapped against the sides of the tent. Just as we would drift off to sleep another gust would lift the tent up and the fabric would strain against the stays. It got so bad Mark worried it might rip the grommets out, so he climbed out in the middle of the night and took the stays down, tucking them under the tent for the night. If there were any animals around they must have gotten an eyeful, Mark clambering around in the wind in his boxers. 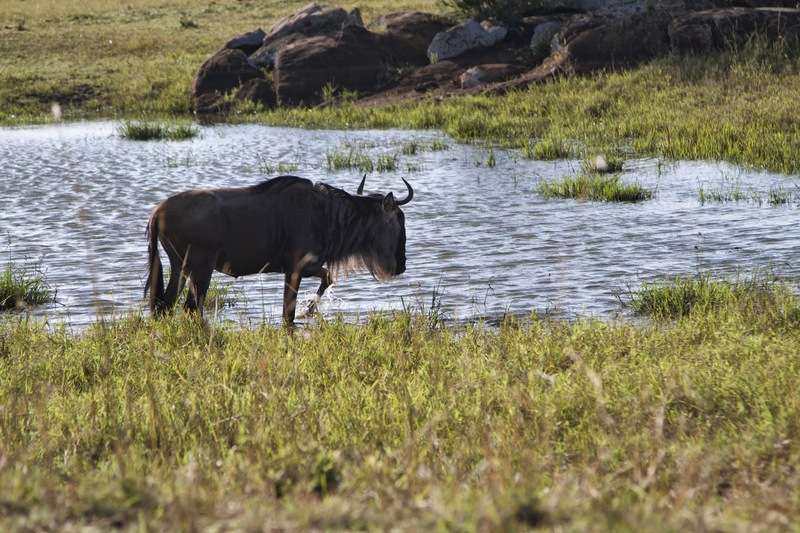 Wildebeest at one of the temporary watering holes created by the late rains. The Serengeti had been everything we'd hoped. 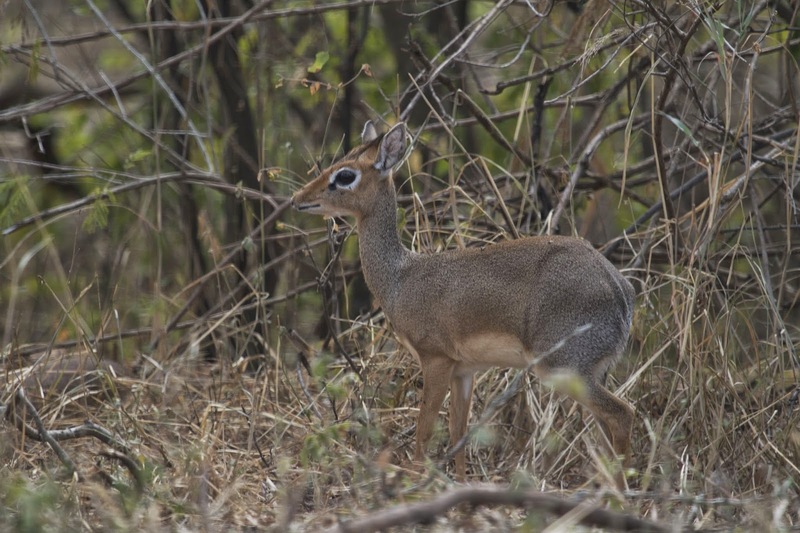 It had rewarded us with a leopard sighting, cheetahs, a crocodile, some interesting camp mates and the crowning glory, a little piece of the great migration, straight out of the National Geographic specials we had watched as kids. We couldn't have asked for a better experience. Well, except for those #$&^ing flies.